With all the nasty weather around the Country lately I thought it would be good timing for some generator talk. The folks at Kohler were generous enough to share some of their expertise with generators for some interesting Q&A. When power is cut off for an extended period of time, some consumers flock to hardware stores, DIY home centers and other retailers to purchase portable generators. A portable generator is sometimes viewed as the appropriate option when it comes to delivering backup power in an emergency situation or blackout. However, it’s important for people to know they have options when it comes to safe, reliable backup power. In addition to portable generators, there are permanent standby generators that automatically turn on when the utility power fails. The homeowner does not need to be present to operate the generator. A transfer switch automatically monitors utility power and transfers the electrical load to the generator if power is lost usually within 10 seconds. A standby generator is installed outside the home, much like a central air conditioner, and runs on propane or natural gas. It powers critical appliances and systems: lights, furnaces, air conditioners, refrigerators, sump pumps, home security systems, office equipment and delicate electronics. Here are some fundamental differences between standby and portable generators. A standby generator is permanently installed outside the home similar to a central air conditioning unit, while a portable generator can be moved from location to location. A standby generator runs on natural gas or propane and hooks up to existing gas lines. A portable generator must be filled with gasoline every few hours. As many gas stations will not be able to pump gas during the outage, gasoline needs to be stored to last through the outage (approximately 70 gallons of gasoline would be needed for a five-day outage.) In addition, the oil must be frequently changed, especially if running continuously. A standby generator is fully enclosed, while a portable generator has exposed engine parts, which are often very hot. Standby generators turn on automatically when the power shuts off. A transfer switch constantly monitors utility power and transfers the electrical load to the generator if power is lost, protecting the home even if the home owner is away. A portable generator must be manually started and stopped – meaning the homeowner must be home during a power outage. A standby generator can power critical and sophisticated appliances and systems in your home, including lights, heating/cooling systems, refrigerators, sump pumps, home security systems and more. If using a portable generator, appliances need to be plugged-in to the unit using extension cords. The extension cords must be rated for the electrical and distance they run to the portable generator outdoors. (A portable generator must never be run indoors due to carbon monoxide risks.) Any items that are hardwired to the home, such as heating/cooling systems, security systems, etc., cannot be powered by a portable generator. A standby generator delivers clean, consistent power, which is important for sophisticated electronics like big-screen TVs, computers, etc. Some portable generators provide lower-grade power quality, which can damage and degrade sensitive electronics. Standby generators are installed professionally in advance of an event and provide safe, “hands-off” operation for the homeowner. Portable generators must be operated by the homeowner under the duress of an unexpected outage. This can lead to the necessary safety precautions being overlooked. Standby generators range from 8 to 125 kilowatts. It’s important to choose a standby generator that meets your needs and lifestyle. If you simply want to power a few key appliances in a large home, or everything in a smaller home, an 8- to 20-kilowatt generator may serve you well. If you have a large home and want to keep everything powered up, a larger generator will be required. To determine what size generator you need, contact a local power professional (dealer) or licensed electrical contractor familiar with standby generators. Before you meet with a contractor, you may want to get some estimates from an online sizing tool such as the calculator found here. In addition to selecting the size of the generator, don’t forget about its appearance. A generator sits outside your home – permanently, so look for a unit with a bold, clean look and one that is corrosion resistant, particularly in salty air or moist environments. What are some Safety Tips when it comes to power outages (What to do and what not to do). Every year, millions of homes lose power for hours – or even days – at a time. It doesn’t matter what part of the country you call home, everyone is susceptible to outages, particularly when it comes to severe weather. Being prepared is the best defense for such energy emergencies. Here are 10 things you can do to ensure the safety and security of your family during the next power outage. Review your Weather Emergency Plan (i.e. numbers to call, meeting places, key contacts, etc.). Also, grab a backpack or purchase a large plastic bucket with a lid from a local hardware store or home center. Stuff the backpack or bucket with three days worth of food and water. Other items should include a flashlight, battery powered/hand-cranked radio, first aid kit, money, medications and a CD or USB drive containing important documents. Store the kit in a place that is easily accessible in an emergency situation. Have a battery-operated or weather radio, multiple flashlights and a battery-operated clock and fan, along with extra batteries. Leave one light on so you will be able to see when power is restored. Stay away from fallen wires, flooded areas and debris. Treat all down wires and anything touching them as though they have electricity running through it! Do not connect portable generators directly to the electrical system of your home. Electricity could flow backward into the power lines and endanger lives. Either have a qualified electrician perform the work or plug appliances directly into the generator using the proper-sized and rated extension cords. If you’re running a portable generator, be sure to use properly rated extension cords (electrical lode and length). Also, make sure the portable generator is properly vented to avoid carbon monoxide poisoning. Consider installing a permanent standby generator system for your home for the next storm to automatically supply power safely and worry-free for your family. 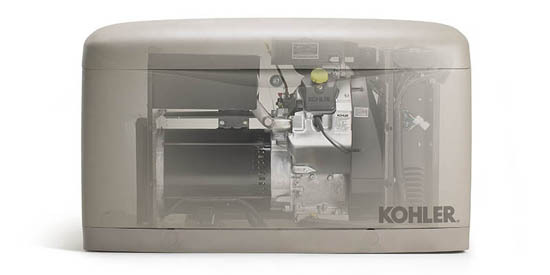 For more information about standby generators, visit KohlerSmartPower.com.